Welcome to the first ever Pocket Patchwork sew-a-long project! I've named our little quilt Busy Work, because the Prairie Women tucked their bits and pieces of fabric into the pockets they wore under their skirts, where they'd have some stitchin'...busy work... handy while they sat and chatted with their friends. Here's some stuff you need to know. We'll work on our quilt over six weeks and I'll post instructions once a week. Hopefully, that will be do-able for you. 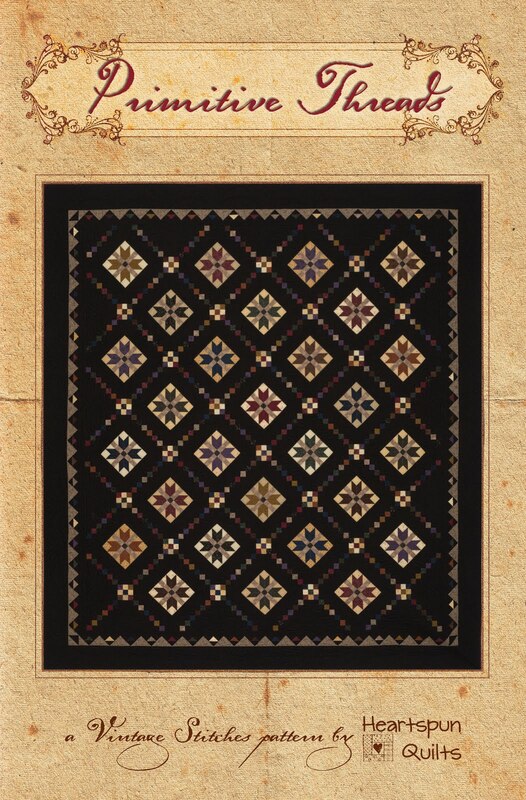 I'm making my quilt from three colors ~ black, brown and neutral, and it's scrappy. The blocks finish to 6". I'll give cutting instructions with a photo of the block assembly and of the finished block. 1). Draw a diagonal line on the wrong side of both 1 7/8 inch light print squares. Match with black squares. Sew 1/4 on each side of drawn line; cut apart and press to dark. HST should measure 1 1/2 inches. Sew into a pinwheel to measure 2 1/2 inches. Block one is done. It's always so much more fun to sew with a friend! Thanks for sewing-a-long with me. Let's do it again next week! P.S It not too late to join our Pocket Patchwork sew-a-long! The best way to receive the block photos and instructions is to sign up to receive emails of my blog postings. It's easy! Type in your email address where it says "Follow by Email", on the right hand column of this blog page. While you're at it, I invite you to become a Follower, too! Sunday afternoon, Lynne (as in Lynne Hagmeier of Kansas Troubles Quilters) arrived at my doorstep for a visit and some much needed girlfriend time. I coerced her to stay a few days on her way home from Osh Kosh, WI, where she taught and lectured at a wonderful quilting event there. Honestly, (and happily) it didn't take much to talk her into it! Her visit gave me the perfect reason to take a break from my quilt market preparations at the keyboard and spend time just talking about family, friends, and work related stuff. This also gave us another opportunity to do more planning for our first quilting cruise ~ The Great Girlfriend Get-Away. We're going to Alaska in August, and, of course, we'd love for you to join us. We have two cruises in the works for next year....one to the Caribbean, and one to Canada & New England, just in time for the fall colors. We'll be posting more about that once all of the details are worked out, so please stay tuned. Lynne and I were able to do some sewing, and I worked on American Gothic, which is pictured in the background of the photo above. I still have a few more rows to go and then it will go out for quilting. It'll be featured in an upcoming post once the photos are done. Tomorrow morning, I'll be heading to WI to meet my girlfriends for a quilting getaway at The Mill Creek Settlement Retreat. More sewing, sewing, sewing on new patterns for market....YAY! 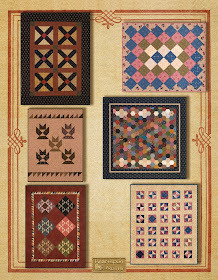 Don't forget that my Pocket Patchwork sew-along begins on Friday. See the posts below for more info on that. I'll have oodles of stuff to blog about next week. Until then...Happy Stitching! The sewing machines have been humming, and the keyboard has been getting a good workout as well as we plow through the patterns and quilt projects for spring market. I'm just beginning to see a dot that is the light at the end of the tunnel!! This little gem will be in Journey Four. I don't have a name for it yet because I haven't decided what historical story will go with it. Knowing the subject matter and writing the story always plays a huge part in naming the quilt. I have all the subjects chosen and research complete, I just haven't had the time to write them yet. I love the soft tones of the background fabrics (Mrs. March by Lecien) and paired it with a bunch of dark browns. My make-do block is in black and I love how it all turned out. What do you think? My first Pocket Patchwork project is ready to go and will begin in earnest next week Friday, March 30th. We will sew-along once a week. I thought since we're all pretty busy, that would be do-able. I'm hoping that if I can find a few minutes once a week, that you can, too! The photo above shows you the fabric selections I made for this little quilt. This is a sampling of what you'll need. Choose three colors, a light, medium, and dark. I choose to work with Little Gatherings by Lisa Bongean for Moda. I used 3 charm packs and a Fat Quarter of the brown to start with. I may add one more Fat Quarter, but haven't gotten that far yet. If you want to sew-a-long with me, the best way will be to sign up to receive my posts via email. You can easily do this by entering your email address in the "Follow by Email" icon on the right side bar of my blog. That way, you can print the email which will have the photos of what you're making, and the cutting instructions. 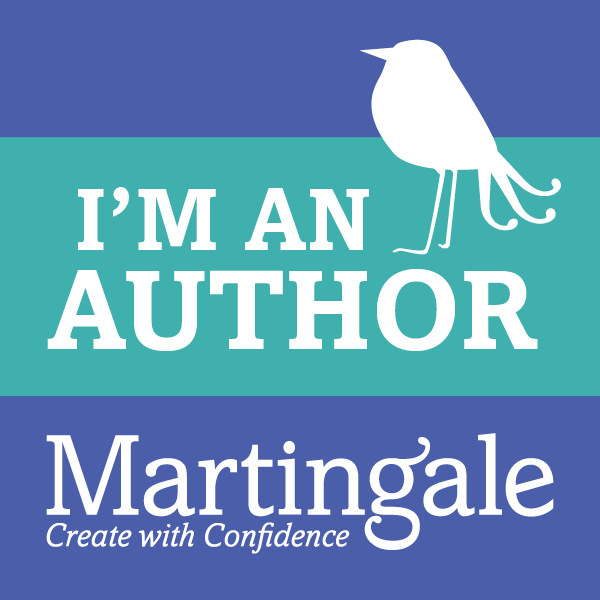 While you're at it, sign up to be a follower of my blog, too! Pass the word to your quilting friends, and ask them to follow my blog, and sign up to sew-along with us. The more the merrier!! Sunday, I'm expecting an out-of-town guest for a good long visit. We'll be here at the house sewing away, and then we'll head up to the Mill Creek Settlement Retreat for a long weekend of shopping, antiquing, eating and laughter. Sounds like just what a stressed out quilter needs! Stay tuned for lots of news and photos to come. And, as always, I thank you for taking a few moments to visit with me! 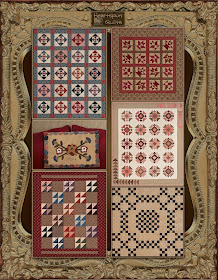 Lucy's Prairie Pockets & Pocket Patchwork!!! Today, we celebrate ﻿our passion with the rest of the nation. Like so many of you, I can't begin to find proper words to express how much quilting enhances and fulfills my life. It allows me to touch and connect with our quilting ancestors, express my creativity, spend time with kindred spirits, brings peace to my heart just from putting two pieces of fabric together and guiding them thru the machine, and fills my very soul. I know it's the same for most of you, so I honor all of you today as well. Celebrate! Spend some time with your fabric, sewing machine, and needlework. I know I will!! Lucy's Prairie Pockets & Pocket Patchwork! Pockets were made from every fabric imaginable. Some were embellished with beautiful crewel and embroidery work, some with patchwork and scraps, and others of plain cloth. Women kept all kind of needful things in their pockets such as letters, books, glasses, etc., and of course, thimbles, needles, thread, and patchwork. At night, they often hung from the bedpost to hold a watch, handkerchief or glasses. Pockets were very much a part of housewifery in early America, and today, we can enjoy making a pocket for our own needful things, or just to decorate our homes. I can't tell you how much fun I've had creating a bunch of pockets. They were so much a part of women's lives in the eighteenth and nineteenth century, and I just had to make them! The pattern will be available, hopefully, in April, and I will let you know when it's ready. Now....about the Pocket Patchwork part.....as you read, the women kept fabric patchwork, needles, thread, and scissors in their pockets. As I did my research, I found it was common for the ladies who met at a church or social function, to pull the patchwork from their pocket, and sit and sew while they visited together. So....In that spirit, I thought we should sew together, too! Pocket Patchwork will be a sew-a-long with me! 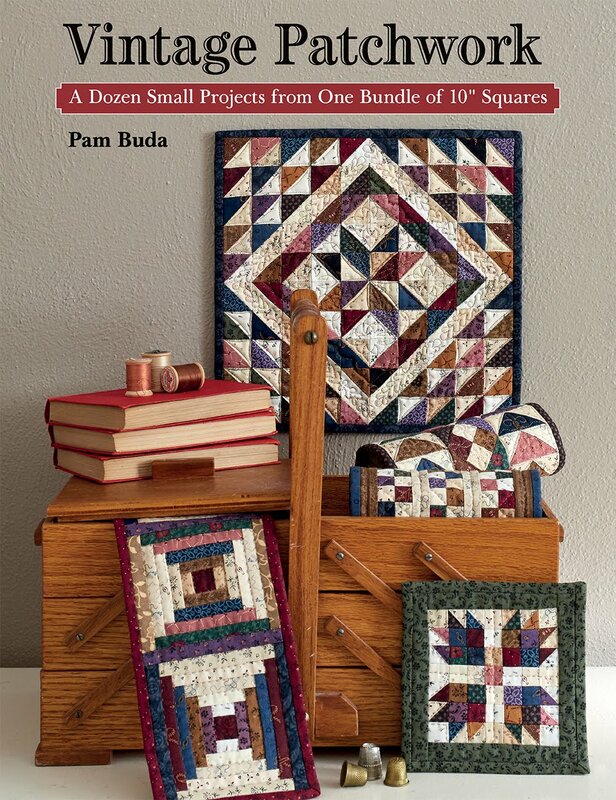 We'll be making small doll quilts together, and you can be sure I'll throw in make-do's as well. I had hoped to have our first project ready to go by now, but other work has kept me from doing so....but it won't be too much longer, I promise! 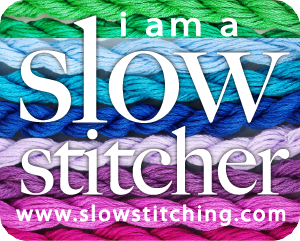 I'd love to hear what you think, and I can't wait to get started sewing with you! 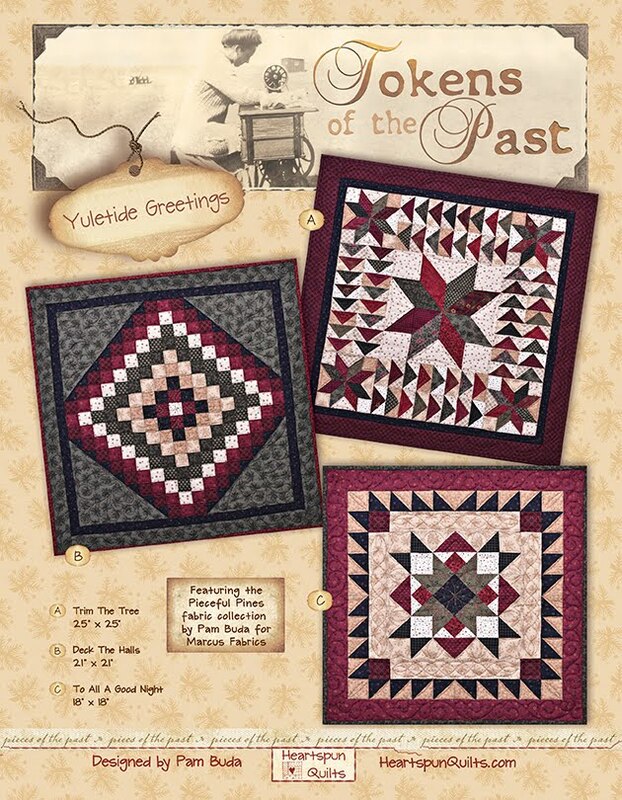 ﻿Wishing you peace while piecing! The last few days have flown by in a blur, but what else is new? I'll have several new things to share with you next week, so for now, let's continue with some awesome Prairie Women's Sewing Circle show-n-tell. All of the pictures in this post have been made by the very talented group of ladies in my own Prairie Women's Sewing Circle clubs. This is Sue's quilt, called Elizabeth's Prairie Garden, and is the hexagon bonus project in Journey Three. She fussy cut quite a few little surprises into her quilt and is in the proecess of hand quilting it, too! Here's another version of The Contrary Wife, also from Journey Three. This quilt is called A Light in the Window, Journey Three. I just love the border fabric!! How I love seeing the same quilts done in different fabrics, and both of these quilts, called Olde Settler's Way, from Journey Two, are more stunning in person than the photo shows. Isn't that always the case?! 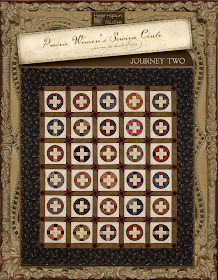 The Quilting Gathering, Journey Two, seems to be a popular quilt to make. Those little blocks would be difficult, to say the least, except they are paper pieced. 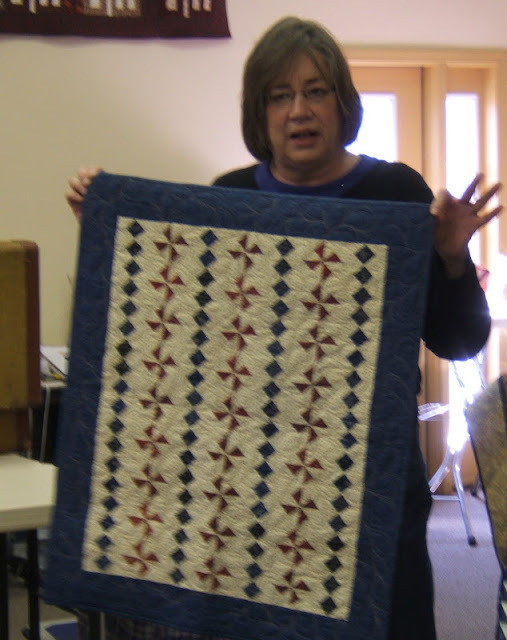 Many of my club members either had never paper pieced or were not fans, but with a demo and some helpful hints, they gave it a try - and loved it. You just can't argue with the precision paper piecing gives. Love those make-do blocks, too! This quilt, showcasing the Yo-yos featured in Journey One, is called Scraps from Home. I'm thinking the word "fantastic" would aptly describe this quilt. I love the coloring, adore the border fabric (it's one of my favs!) and it's hand quilted. Fantastic, don't you agree? We'll draw our show-n-tell to a close with a beauty. This quilt is Gentlemen Caller, from Journey One. Again, the photo just doesn't do the quilt justice!! Loads of fun make-do's in there, too! I know I'm biased, but I have to say.....Great Job....to all my club members! I hope you enjoyed the quilts of their labors!! I'm actually sick of hearing myself say that I'm still working on all my goodies for quilt market, but when it's the truth, what else can you say? Every day we are making good progress, but when it comes to having something new to show you, I feel like I haven't done much because we're still in the middle of things. I sure hope you won't give up on me because there is so much I want to tell you about, but I just can't yet!!! AAAHHH!!!! So, how about we take a look at what the Prairie Women have been doing out there with their busy hands and needles humming. Time for Show-N-Tell. 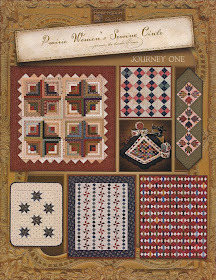 This quilt from Journey Three is called The Contrary Wife, and was made by the Bittersweet Quilt Shop in Pinconning, MI. These ladies are standing inside of Bittersweets Quilt shop, and each one of those quilts are versions of The Contrary Wife as well. 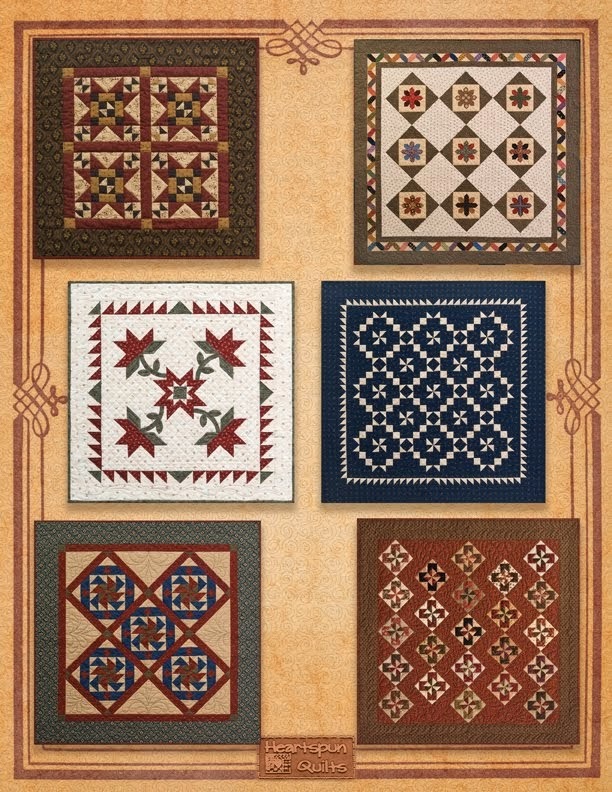 The pattern comes with 4 different options for this particular quilt. I love them all....great job Prairie Women!! Don't you think the shop looks wonderful?? I wanna go there!! 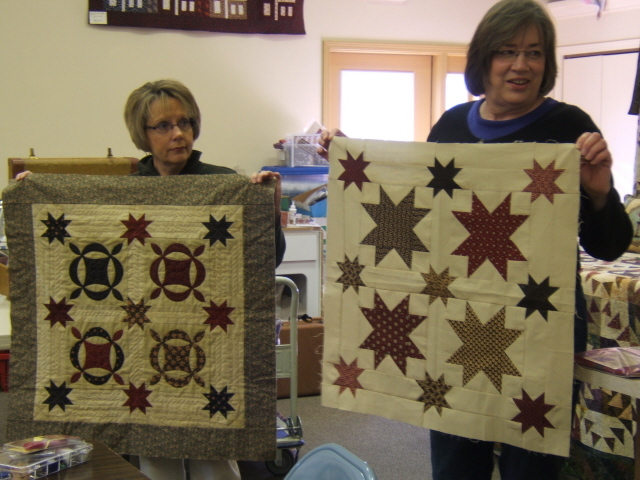 The Prairie Women at The Back Door Quilt Shop in Greenwood, IN, have busy hands and needles as well, working on their versions of The Contrary Wife. Visiting this quilt shop has been on my to-do list for too long. I have to get there this summer! 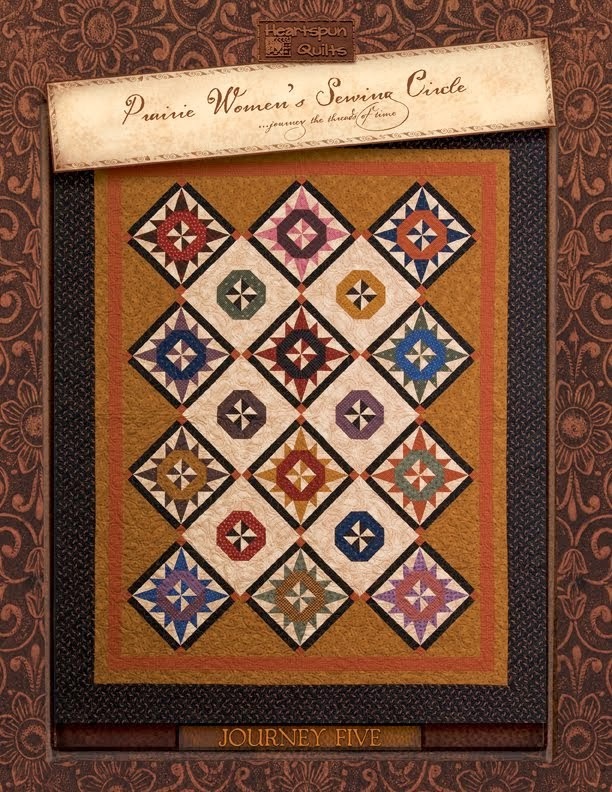 Yet another quilt from a Prairie Woman at The Back Door is from Journey One, called Seneca Falls. Love the fabric choices!! Well....Blogger is running so incredibly slow, that I must get to work, so how about more Show-N-Tell in my next post. 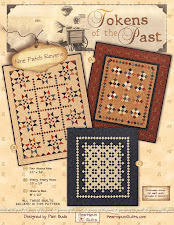 I'm just bursting at the seams to have my own Show-N-Tell about all that is new from Heartspun Quilts. Soon....very soon. We start with our paper piecing pattern, one square that will be become the four triangles, one center square, and four rectangles. It is ssooooo fun picking out the fabrics for each block! Start by cutting the large square twice diagonally to yield four triangles. 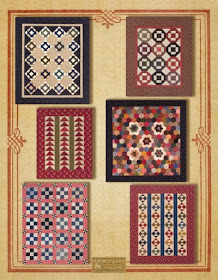 Notice how all of the shapes are the same as the paper piecing pattern! Difficulty, confusion, and frustraion can happen when your paper piecing pattern is made of many oddly shaped pieces....like many diagonals, although they often make the most amazing blocks!! For the Cross X block, there aren't any diagonals, and straight forward shapes like this make for easy piecing!! Here are the components after piecing and before trimming. There's plenty of extra fabric to work with. The next step is to trim the blocks with a seam allowance. It's already looking so cute! Once the segments have been trimmed, we can remove the paper. 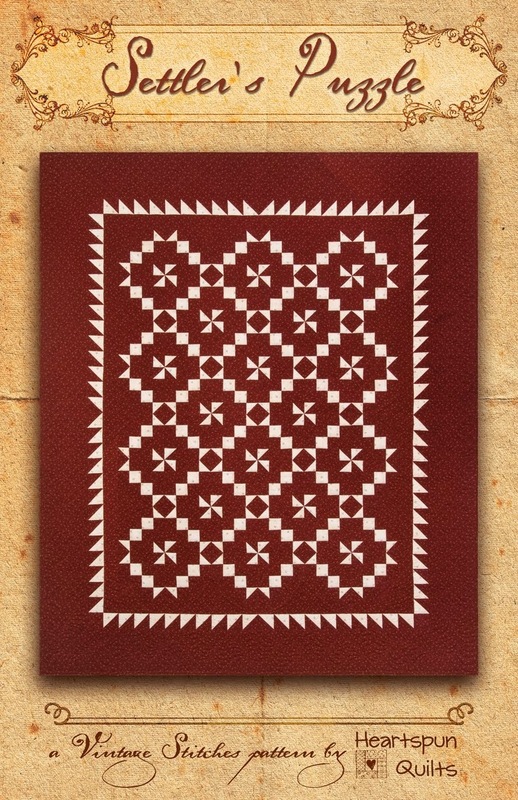 I highly recommend using Carol Doak's Foundation paper, available at your local quilt shop. Voila! The three sections of the block are sewn together to utter perfection! No need to worry about the bias. I'm thinking it turned out great, (if I do say so myself!) and think I'll make another. That wasn't so hard, was it? Do you think you'll give it a try? 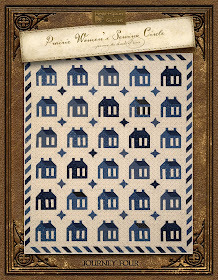 Stay tuned for news about when my American Gothic pattern (which features this block) is released. I'm still in the depths of the pre-quilt market frenzy, with what feels like a thousand things to do everyday. I hate to be a tease, but I'm still working on all of the particulars. Any guesses what Pocket Patchwork is going to be?? Be sure to stay tuned. I'm anxious to get started, so I don't think you'll have to wait for long!! I need to know....am I the only one who falls in love with quilt blocks? Do you see a block, and feel something stir, that then compels you to make dozens of that block you love? That happens to me more than you would think! I don't really question it, I just go with it. I'm just wondering if I'm the only one? For today, my attention is on the Cross X block. It's a traditional, old block, which makes it all the better for me! I think it does great things in a quilt....creates a lot of movement and interest without being overwhelming. The construction of this block is quite simple. The math for this block can be a nightmare... but there's a simple fix for that! Paper piecing. Now, I now that paper piecing can be nasty words in some of your vocabularies, but trust me, this block is made for paper piecing!! Knowing that many of you make the sign of the cross at the mere mention of paper piecing, I have included rotary cutting and piecing directions for the mighty Cross X, with.....normal, everyday fraction sizes. The problem with this cutie is that, depending on the size of the block you want, those normal fractions become nightmare fractions. Those scary fractions disappear if you're willing to paper piece the block!! 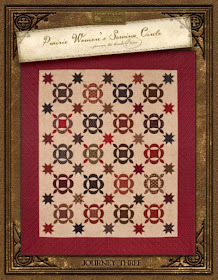 I have two new quilt projects using Cross X. Wanna see what they are? We've produced a large pile of Cross X blocks and I just love them!! 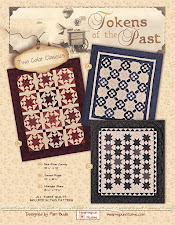 These blocks are for a new, large quilt called American Gothic which will be released at quilt market in May. The pattern requires 90 blocks and we're almost there! I can't assemble it just yet as I've chosen to use a new fabric for the setting that won't be coming out until April, but at least the blocks will be ready and waiting. What do you think? Are you loving Cross X yet? ﻿﻿This little cutie is a new quilt for Journey Four of the Prairie Women's Sewing Circle club! I just adore this quilt!! Didn't I tell you the Cross X block mades for a graphic presentation? I hope you like it, too! For those of you who aren't fond of paper piecing, I'll show you just how easy this block is to paper piece in my next post...so hang in there with me, won't you? I'd also love to hear if you're madly in love with a block you want to make. Perhaps I'll get hooked on it too! !